Since the beginning, George Jenkins sought ways to bring beauty to his stores. One of the most unique examples takes us back to the 1960s. It all started when Mr. George was on a trip to California. He happened to drive past a building decorated with a colorful mosaic tile mural. He had never seen such a grand piece of artwork on the outside of a building, and thought it would be the perfect touch for one of his stores. 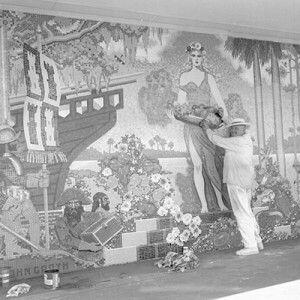 He contacted the California artist, John Garth, and asked him to come to Florida to create a similar mosaic mural for a new Publix that was being built in Ft. Lauderdale, Florida. Mr. Garth designed a stunning scene depicting all the foods of the world coming together for Publix customers. It featured a golden-haired goddess holding a bounty of produce, and Mr. Garth’s own daughter was the model for the goddess. It consisted of two panels, one 50’ x 10’ and the other 20’ x 10’. He brought the massive quantity of sorted and numbered tiles to Florida, and a team installed the pieces on site, section by section, until every piece was in place and the scene was complete. It must have been like putting a huge puzzle together! When the store opened on August 29, 1961, the mosaic was a sight to behold. At the time, it was the first mosaic mural in Florida, and one of only two in the entire country. 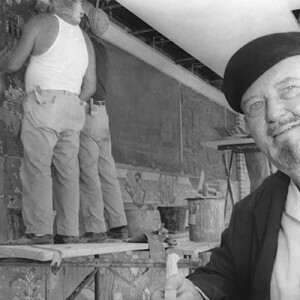 He would come back to Florida in 1964 to install two more tile mosaic murals on stores in Lakeland and Winter Haven. In the mid-1970s, Florida artist Pat Mills was commissioned to create murals for Publix. The first of her creations featured a bounty of colorful fruits and vegetables flowing from a horn-of-plenty. Later, she began researching each city to incorporate local themes into the designs. From landscapes to city history, the murals reflected the individual personality of each community. During her 20 years beautifying Publix stores, she created more than 200 pieces of art. Just imagine how many tiles that would add up to! Former mural at Store 161, Palm Beach, Fla., created by Pati Mills. Where are the murals today? Sadly, few of the original murals remain today. Over the years many of these murals were lost as stores were replaced or re-built to make way for new buildings. About 26 remain, including locations such as Ft. Myers, Jacksonville, Miramar, Orlando, Palm Bay, Pembroke Pines, Seffner and other cities. In 2018, the original Ft. Lauderdale mural was “reborn,” when artist Tom Pritzen recreated John Garth’s artwork at the Polk County Tax Collector’s office in Lakeland, Florida. A celebration was held on November 29, and Mr. George’s family members were given the honor of unveiling the mural. What made the event even more special was the fact that this building was originally a Publix built in 1953. Gregory Fancelli, grandson of Mr. George and Barney Barnett, son-in-law of Mr. George unveiled the artwork. Have you ever seen a mural on a Publix store? Which one is your favorite? Tell us your story in the comments below. Jennifer B. has been with Publix since 1980, when she started working part time in high school. She has held positions of Assistant Director of public relations and Director of media relations, but her current role as the Company Historian is the highlight of her career. She loves sharing Publix trivia, telling stories about Mr. George and solving Publix’s history mysteries. In her life outside of Publix, Jennifer enjoys spending time with her husband and catering to the whims of their cat Jackson, who is master of all he surveys. I started in1989at Ft. Myers,205 store, now a Big Lots, it is across the street from my home. I always look at on my way in and it makes me smile. If they ever take down i will try and save a piece. Sallie, these murals always make me smile, too!